IN the year of the ballot box, expats will join the Spanish electorate in casting their vote in the next round of elections at the end of this month. And it could be a game changer. With the Andalucian regionals out of the way, and the general election looming at the end of the year, it is now the turn of local politicians to drum up support and don’t we just know it! Every municipality in the country has been busy refreshing its floral borders and giving its civic buildings a lick of paint. But it’s purely cosmetic. After four years blighted by revelations of fraud, mismanagement and corruption in high places, town halls across the country will no doubt be in for a shakedown. And, unlike the regional or general elections, expats registered on the Padron will be able to have their say and, perhaps, tip the scales. All municipal elections will be held at once, on May 24, while 13 of Spain’s 17 regions will also be dishing out voting slips that day. Andalucia, Catalunya, Galicia and the Basque country work on separate electoral cycles. Much like March’s Andalucian vote, the outcome of the country’s other regional elections will reveal whether ‘newer’ parties Podemos and Ciudadanos have a chance of knocking the PP (Popular Party) and PSOE (Spanish Socialist Workers’ Party) off their respective pedestals at the year’s end. And while the new kids on the block may not be running in the majority of local elections, the results will serve as an early indicator of public opinion before the general election. Voting in local elections works via proportional representation. 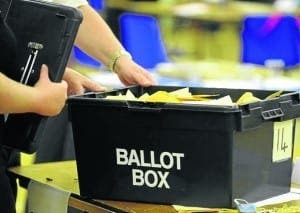 Each party submits a list of up to 25 councillors. The number of seats, or local government councillors, they end up with depends on what percentage of the vote they claim. Within a month of the votes being cast, a mayor is elected. He or she is usually the number one candidate for the party which commands the most seats. In the event of a split decision – two parties claiming an equal number of councillors – then a third party may form a coalition. In Malaga, there are currently 101 municipalities, each with its own mayor. That number will rise to 103 after the upcoming election, as Serrato and Montecorto have recently become independent in their own right. Only the PP and the PSOE are standing in all municipalities. The IU is standing in 96 elections, while Ciudadanos is represented in 18. Of the 101 mayors currently in office, only 10 are bowing out without a fight; the remaining 91 are gearing up for battle to retain their seats. Despite there being two more mayors, there are three less parties standing in Malaga province than there were in 2011, down from 73 to 70. However, in 26 municipalities, the number of parties standing has increased. In Cortes de la Frontera, for example, political division has led to a plethora of nine new parties being formed. In Marbella, Mayor Angeles Munoz is hoping to hold on to her seat for the fourth time, after an impressive victory for the PP in 2011. However it’s by no means in the bag. Her party’s reputation has taken quite a battering since claiming 52% of the overall vote in Marbella four years ago. And, this time round, she faces some stiff competition from no less than 10 other mayoral candidates. Four new parties are in the running for the first time in Marbella, including environmental party Equo and Podemos breakaway group, Costa del Sol Si Puede. 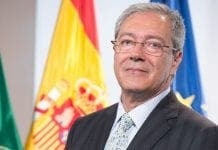 Munoz’s main threats come from PSOE’s Jose Bernal and Rafael Piña, for Opción Sampedreña, who is running for mayor for the third time in as many elections. That said, voting in March’s Andalucian elections suggests the PP is still popular in Marbs, with the party taking almost 32% of the share to the PSOE’s 29%. 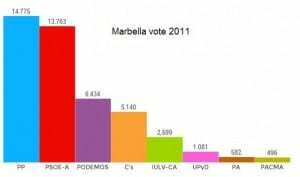 And there are other changes that could affect the outcome in Marbella, where campaigning has taken on a ‘PC’ twist, with paper posters and flyers outlawed for the first time. Instead, each of the 11 parties has been given equal time to promote their party on electronic advertising boards throughout the town. Meanwhile in Estepona, PP Mayor Jose Urbano’s ‘flower power’ revolution looks set to blossom into a majority that will keep him in office. His party stormed the last local elections with a massive 48% of the vote, and came out top again in the recent regionals, with 35% of Estepona voters backing them. Urbano’s task may be made even easier by the reduced competition. In 2011, there were 13 parties to choose from, compared to just six this time round. But the flowerpot-loving Mayor is not resting on his laurels. 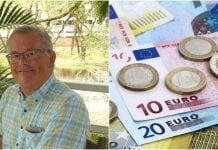 As well as continuing his mission to transform Estepona into the garden of the Costa del Sol, Urbano has promised a 10% IBI tax reduction if he retains his chain of office. In the red corner, his PSOE opponent David Valadez is promising a more ‘transparent’ town hall and wants to improve the local water system if his party wins the most seats. And although the cards are stacked in favour of the PP, the PSOE has one further trick up its sleeve which may bag the party a few extra supporters. While the majority of town halls are run by middle-aged males, Estepona PSOE has made it a priority to even up the odds with a list of 25 candidates that runs in boy-girl-boy-girl order. Whether this blow for gender equality will see more women walking the local corridors of power is anyone’s guess. But in a male-dominated field (see pullout box, above) at least one party is doing it for the girls. Meanwhile, up the road in Ronda, PP Mayor Maria de la Paz Fernandez will again be pushed all the way by the PSOE for the top seat. Last time they tied with 30% of the vote each but a pact between the PP and the PA (Andalucian Party), which came third, saw Fernandez crowned mayor. Fernandez has promised to bring ‘stability and transparency’ to Ronda but if the Andalucian elections are anything to go by – when the PSOE claimed 36% of the vote, 8% more than the PP – we could see a new mayor walking in the door. While the regional elections are a different beast to local elections it will largely be the same people who turn up at the polling stations, but this time with the all-important added extra of the expat vote. Whatever the outcome, the big boys in Madrid will have their beady eyes fixed on the fate of every town hall in the country. They could badly use some free lessons on how to play it when their turn comes at the general election in six months time. Watch this space! As one OF THE new independient parties standing for election to the Ronda city council, firstly congratulations on a comprehensive and well-documented overview in your article. Just a few points: Podemos decided no to stand in any council elections in Spain, preferring to concentrate efforts on the regional and national elections. This has led to an amazing surge in the creation of new, entirely local, political parties with the “Podemos DNA”. Over 500 new parties were registered this year alone. In the Serranía de Ronda, 14 such parties are standing, twice the number of 4 years ago. The woman and man in the street are just simply fed up with the corruption, the incompetence and the sheer indifference of the main parties. Non-Spanish residents have a right and an obligation to vote! If you don’t, no more complaining about your useless ayuntamiento – you’ll have done nothing to change it! I agree with the above comment. Roughly: ‘Don’t vote: don’t complain’. There are a number of new municipal parties around, as stated, and generally based around the Podemos philosophy. One such – a coalition of several small local parties headed up by a British councillor – is called ‘SOMOS MOJACAR’ and the group, with a majority of foreign candidates on the party list, may cause Jessica Simpson to become that rarest of things: a British-born mayor in Spain.